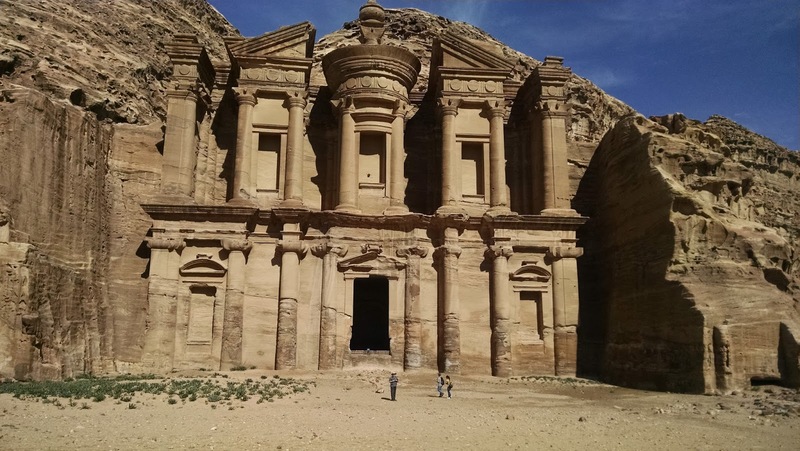 Petra is one of the New Seven Wonders of the World, built by the Nabataeans in 312 BC. Now, I don't mind admitting that I was under the impression that Petra was really just that temple-looking thing carved into the rock of a narrow canyon that you've probably seen in Indiana Jones and the Last Crusade. But I noticed that some times the photos of Petra had sky behind it or it was at the bottom of a canyon. Truth be told, I thought the name of the building was Petra, much like "the Parthenon" or other ancient buildings. 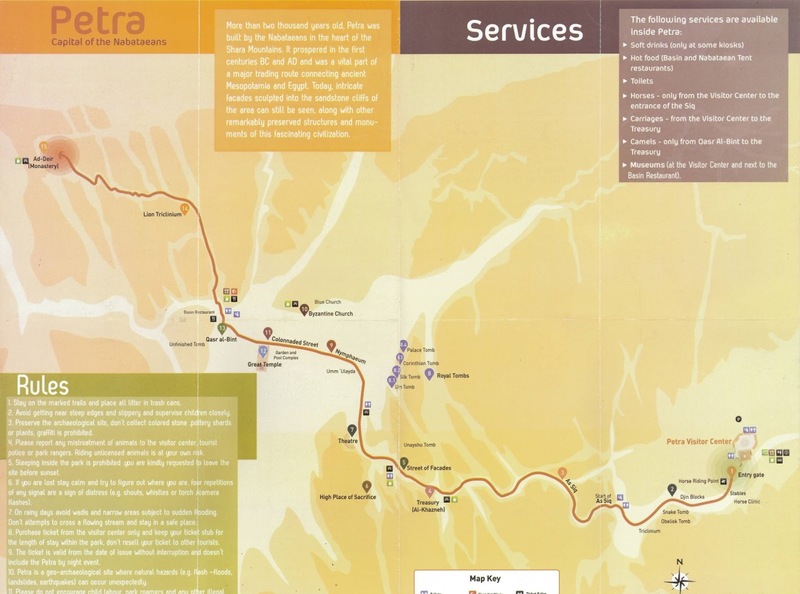 I'm not sure why, by I never quite put it together that these are basically two different locations (and about as far apart as you can get) within Petra. The one in the canyon is the Treasury and the one on the mountain with the sky is the Monastery. The Monastery: The Stairway to Heaven? 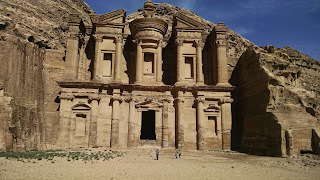 We drove into the town outside the historic Petra fairly late at night. The speed bumps on the road in only span one lane, and the locals seem to think swerving into on-coming traffic around the speed bumps is totally reasonable. You can either ride horses to the entrance of the Siq (canyon), or ride in a horse-drawn cart through the canyon to the Treasury. Our group split up, but no one walked. Greg, Kacey, and her dad rode horses down to the canyon entrance, then walked through the canyon to the Treasury. The ride came to 10 JOD each. I thought they said 2 JOD when we started, but whatever. We could have walked down the Siq, but this part is kinda dull. Kacey's mom and our kids rode in the cart the whole way to the Treasury for 20 JOD total. 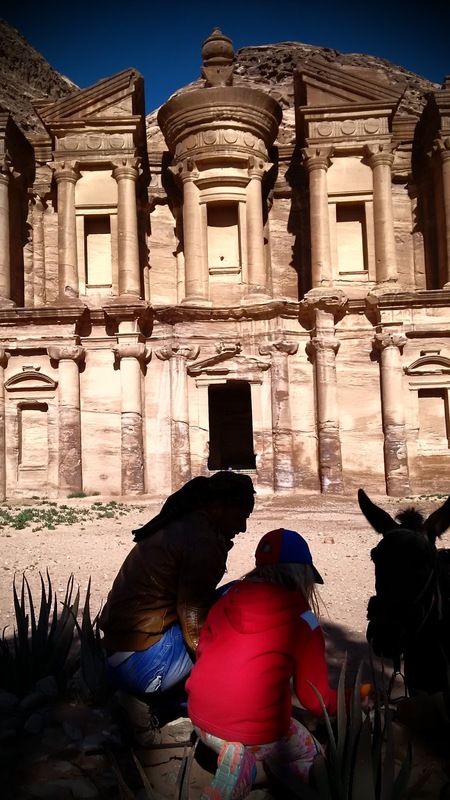 Lots of folks trying to get us to ride donkeys onward from the Treasury. The rest of us rode in on horseback. The scenery changes dramatically at the Siq. The approach was a wide, open area with structures carved into the distant hillside. Slowly, those hills converge into a canyon that was so narrow the sun didn't shine onto the floor. While three of us walked, the other three had ridden through this area. They said it was quite bumpy, as you might expect riding in a horse-drawn cart over unimproved or cobble stone paths. The Canyon Road is paved! 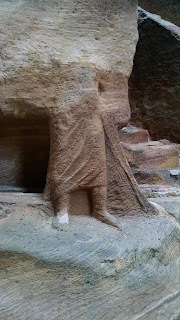 A partially worn carving in the canyon. Guess who feels like Indiana Jones right now? We all met up again at the Treasury, and walked to the first steps that led up to the Monastery. We could have hired donkeys at this point, but that would have prevented us from just meandering around and looking at what we wanted to on the way down the gentle slope. The plan is to ride them back though, since we'll probably be a bit tired at the end of the day. 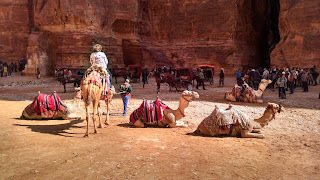 The walk from treasury to restaurant was really the most unexpected part of our visit to Petra. There are so many other buildings here that don't get the same level of attention as the Treasury and the Monestary, but they are almost as impressive. The restaurant had decent food and friendly cats. After lunch, we chose our rides at the restaurant to take us up to the Monastery. The path to the Monastery is basically a long stairway of roughly 850 steps. There are two ways up (and down): hike or ride. It's important to know that you can usually only hire a ride at the bottom, so hiking up and riding down isn't really an option if you change your mind and don't want to walk back down. That's why we rode mules and donkeys up to and back from monastery. Greg had our three-year-old on a mule with him, and our six-year-old rode on a donkey by herself. Some in our group didn't enjoy the precarious ride up the mountainside on the sure-footed beasts of burden, but it was too far to walk for the little ones. At the top, Kacey's mom thought that her horse was eating oleander so that it would die rather than have to take her back down. Kacey's mom and her beloved guide "Audi"
If you recall, the Treasury was built into the canyon wall near everything else, but the monastery definitely feels more remote, standing alone on the mountainside. You can also take a short hike up a hill facing the monastery for a better view. We encountered a herd of goats on the hike. The view of the Monastery from the next hill over. After returning from our hike, Kacey's dad decided started walking back rather than ride and he beat us to the Treasury because we stopped to shop while on horseback. Greg probably enjoyed the ride the most, even though he very nearly flipped head over heels once on the descent. That would have been a bad thing, considering that he was still holding on to our younger daughter in his lap. He also bought a cast metal lion for his trinket collection from a bedouin woman at a stall on the trail below the monastery. She even held the reins of his mule while he fished his wallet out of his cargo pants. Greg also had to dismount at one point to get under a rock arch since mules are rather tall. Rather than walk back up the gentle slope from the base of the Monastery steps to the Treasury, we rode the pack animals. It was a good call. At treasury, Greg rode back to the park entrance with our girls so that they could get to sleep earlier. The ride back cost 30 JOD (it was only 20 JOD for the ride down), but he ended up paying 200 SAR to save our Jordanian cash. By the way, it's really hard to mentally convert SAR to USD (~3.75 SAR = 1 USD) then from USD to JOD (~1 USD = 0.7 JOD) while two exhausted kid are complaining loudly, so the driver probably got a good tip. Kacey walked back with her parents, at least part of the way. 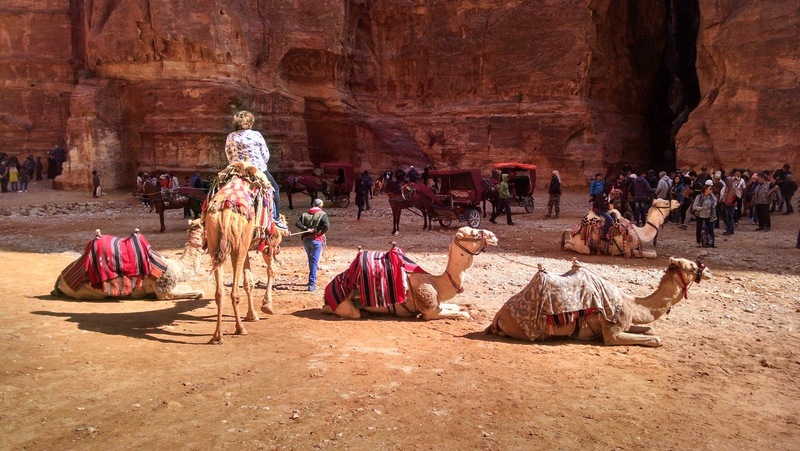 The next morning, we headed out from Petra to the deserts of Wadi Rum, which you've probably seen with out knowing it: the movie Lawrence of Arabia was filmed there.